Researchers in Leipzig are compiling a ground-breaking digital archive of artefacts from around the world. Created to compare Neanderthals with modern man, the archive could revolutionise their field — which is exactly why many oppose it. Visitors to Tel Aviv University are greeted by three skulls with seashells in their eye sockets and on a table behind them, a student completes a detailed drawing of the teeth in a human jaw. The bone chamber lies behind a simple steel door on the ground floor, located right next to the delivery entrance of the anatomy institute at Tel Aviv University, what looks like a simple storeroom is actually one of the world’s largest repositories of human history. Nestled on foam within blue storage drawers are all sorts of fragile bones, from femurs to mandibles, and phalanges to ribs, children’s skulls and a whole range of teeth. These are one-of-a-kind fossils that reveal a key episode in the history of the human species. Archaeologists have discovered what is believed to be a prehistoric ceremonial site on Cave Hill in north Belfast. It follows a community excavation involving more than 400 people at the site of Ballyaghagan cashel on the Upper Hightown Road, which had never before been unearthed. Dr Harry Welsh, an archaeologist with Queen's University, which led the Big Dig project, said some of the earliest items on the site dated back to 3,500 years BC. Federal archeologists are investigating a very old jawbone that turned up Monday along the Columbia River in Kennewick, Wash. The human remains were found a short distance from where Kennewick Man was discovered in 1996 and sparked a decade-long legal conflict. The battles over Kennewick Man have scientists being extra cautious with the new discovery. The jawbone with six worn teeth was spotted in shallow water by a jail work crew doing routine park cleanup. Kennewick Police and the Benton County coroner quickly determined the bone belonged to an adult human, but was too old to connect to any modern crime. There is now broad agreement on the circumstances of Ötzi's death. Around 100 experts on mummies from nearly every single continent gathered for the "2nd Bolzano Mummy Congress" held at the European Academy of Bolzano from the 20th to the 22nd October 2011, with the aim of discussing any diseases he might have been suffering from and the events surrounding his death. From the moment of his discovery 20 years ago, Ötzi -- the 5,000-year-old glacier mummy -- has been puzzling the scientific research community, though little by little he is also revealing many of his secrets. There was broad agreement at the Bolzano Congress about the last hour of his life. Albert Zink, Head of the Institute for Mummy Research at EURAC, reports as follows about the circumstances of the Iceman's death: "He felt safe enough to take a break, and settled down to a copious meal. While thus resting, he was attacked, shot with an arrow and left for dead." There was no evidence pointing to a possible burial as some scientists have suggested in the past. "The position of the mummified body with his arm pointing obliquely upwards, the lack of any piles of stones or other features which often accompany burial sites, runs counter to the burial theory," he continues. While most studies have concluded that a cold climate led to the short lower legs typical of Neandertals, researchers at Johns Hopkins have found that lower leg lengths shorter than the typical modern human's let them move more efficiently over the mountainous terrain where they lived. The findings reveal a broader trend relating shorter lower leg length to mountainous environments that may help explain the limb proportions of many different animals. 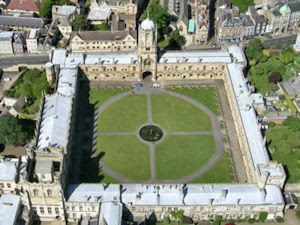 The 2012 Oxford Experience Programme is now online. The Oxford Experience is a residential summer school held at the college of Christ Church, University of Oxford. The programme consists of 6 weeks of courses and participants attend for one or more weeks. It offers a choice of twelve seminars each week over a period of five weeks. Participants do not need any formal qualifications to take part, just an interest in their chosen subject and a desire to meet like-minded people. A reconstruction based on the skull of Norway's best-preserved Stone Age skeleton makes it possible to study the features of a boy who lived outside Stavanger 7 500 years ago. "It is hoped that this reconstruction is a good likeness and that, if someone who knew him in life had been presented with this restoration, they would hopefully have recognised the face," says Jenny Barber, an MSc student at the University of Dundee in Scotland. She has scientifically rebuilt the face of the strong and stocky Viste Boy, who lived in the Vistehola cave near Stavanger, so that people can now look him right in the eye. A hoard of Early Bronze Age gold that was salvaged from a skip following a botched robbery has gone on display. The ancient artefacts were recovered by gardai in 2009 after being dumped along with the stolen safe they had been kept in at Sheehan's Pharmacy in Strokestown, Co Roscommon. The thieves had not realised that the 5,000-year-old gold was hidden among documents when they tipped out what they thought were the safe's worthless contents. ARCHAEOLOGISTS are examining whether one of the country's most popular tourist attractions may have more to it than meets the eye. Newgrange in Co Meath may have a second passage, and it too could be aligned with a solstice event. Teams from Ireland and Slovakia are exploring the possibility -- using technology that has proven successful at the pyramids in Egypt. By studying the pits and scratches on fossilized teeth and analyzing the carbon isotopes on enamel, researchers have discovered new information about the diets of early hominids. “The new data suggests our simple story, of harder and harder diets over time, is not accurate,” said Peter Ungar, a paleoanthropologist at the University of Arkansas, whose lab does microscopic analysis of dental wear. The genus Australopithecus, which lived two million to four million years ago, shows a greater variation in diet over geographic region than over time, he said. IRON Age remains may have been found in a Harborough field earmarked for possible housing development. Archaeological experts have dug trenches at the site, off Lubenham Hill, to investigate further. Evidence of possible cattle and sheep farming by agricultural workers in the Iron Age is believed to have discovered. New evidence of archaeological features in and around the three prehistoric stone circles at Stanton Drew has been revealed. The results of a geophysical survey carried out by Bath and Camerton Archaeological Society (BACAS) in collaboration with Bath & North East Somerset Council's Archaeological Officer in summer 2010 have just been published. The 2010 survey was led by John Oswin and John Richards of BACAS and shows evidence of below-ground archaeological features, including a second entrance into the henge monument first identified by English Heritage in 1997. The second entrance is south-west facing and forms a narrow causeway, defined by two large terminal ends of the circular ditch. Further work at the South-West Circle suggests that it sits on a deliberately levelled platform. A DNA analysis of ancient storage jars suggests that Greek sailors traded a wide range of foods — not just wine, as many historians have assumed. The study, in press at the Journal of Archaeological Science1, finds evidence in nine jars taken from Mediterranean shipwrecks of vegetables, herbs and nuts. The researchers say DNA testing of underwater artefacts from different time periods could help to reveal how such complex markets developed across the Mediterranean. Archaeologist Brendan Foley of Woods Hole Oceanographic Institution (WHOI) in Massachusetts and geneticist Maria Hansson of Lund University, Sweden, retrieved DNA from nine amphorae — the storage containers of the ancient world — from sunken ships dating from the fifth to the third centuries BC. An ancient monument has crashed to the ground after standing for more than 4,000 years as an important landmark. The famous standing stone at Bedd Morris, on Newport mountain, was snapped over the weekend, toppling over and crushing a nearby fence. Archaeologist Professor Geoffrey Wainwright, an expert who has worked on several sites in the Preselis, plans to play an active role in getting the stone reinstated. He said: “It’s a tragedy, the stone has snapped and it’s a real mess. The latest excavation in Göbeklitepe in the southeastern province of Şanlıurfa reveals that inhabitants 12,000 years ago also had a belief system and a certain culture. The remains show there is much more to be discovered from those ancient people, according to scholars. Recent excavations at the Göbeklitepe archaeological site have revealed that ancient people living there 12,000 years ago engaged in agriculture, processed leather, made sculptures and rock accessories and possessed a significant belief system. The site in the southeastern province of Şanlıurfa includes important information on the people 12 millennia ago, said Assistant Professor Cihat Kürkçüoğlu of the local Harran University. When Vincent Van Gogh moved to the southern French town of Arles in 1888, he painted nearly 200 vivid canvasses before cutting off his left ear in a fit of madness. This artistic explosion was possible in part because Van Gogh kept his brushes, paints, and palette constantly at the ready. A new discovery in South Africa suggests that prehistoric human painters also planned ahead, using ochre paint kits as early as 100,000 years ago. But just what they used the paints for is still a matter of debate. Red or yellow ochre, an iron-containing pigment found in some clays, is ubiquitous at early modern human sites in Africa and the Near East. Some researchers think the earliest known art comes from the site of Blombos in South Africa, about 300 kilometers east of Cape Town, where pieces of ochre incised with an abstract design have been dated to 77,000 years old. Scientists have found even earlier signs of ochre use at Blombos and other sites as old as 165,000 years, but solid evidence that the pigment was used in artistic or other symbolic communication has been lacking. Peter Curran puts archaeologists under his anthropological microscope. He meets a tribe who are excavating the culture of the Stone Age on the island of Jersey. A huge early Celtic calendar construction has been discovered in the royal tomb of Magdalenenberg, nearby Villingen-Schwenningen in the Black Forest. This discovery was made by researchers at the Römisch-GermanischesPress Zentralmuseum at Mainz in Germany when they evaluated old excavation plans. The order of the burials around the central royal tomb fits exactly with the sky constellations of the Northern hemisphere. Whereas Stonehenge was orientated towards the sun, the more then 100 meter width burial mound of Magdalenenberg was focused towards the moon. The builders positioned long rows of wooden posts in the burial mound to be able to focus on the Lunar Standstills. These Lunar Standstills happen every 18,6 year and were the ‘corner stones’ of the Celtic calendar. Survey work in the Loch of Stenness has revealed what could be a massive prehistoric monument lying underwater to the south of the Ring of Brodgar. The underwater “anomaly” has come to light in a project looking at prehistoric sea level change in Orkney. The project, The Rising Tide: Submerged Landscape of Orkney, is a collaboration between the universities of St Andrews, Wales, Dundee, Bangor and Aberdeen. But although it is tempting to speculate that the ring-shaped feature, which lies just off the loch’s shore, is the remains of a henge — a circular or oval-shaped flat area enclosed and delimited by a boundary earthwork (usually a ditch with an external bank) — or perhaps a prehistoric quarry, at this stage the project leaders are urging caution. THE remains of a Neolithic stone circle that could rival the most impressive in Britain may have been found off the coast of Orkney. Archaeologists surveying the seabed near the island chain’s famous Ring of Brodgar believe they could have discovered an earlier version just 500 metres offshore from the major tourist attraction. Preliminary findings from an investigation seeking previously hidden historical sites in the area have raised hopes that prehistoric structures built up to 5,000 years ago have survived, even though they were submerged under the waves by rising sea levels. Marine surveys – using remote sensing and seismic profiling techniques – have revealed “anomalies” which could be man-made structures around 12 feet under water. Bei der tödliche Pfeilspitze, deren Entnahme der Südtiroler Landeshauptmann untersagt, gibt es sehr genaue Röntgen und Computertomographie-Aufnahmen.Es handelt es sich um eine 2,8 Zentimeter große, flächenretuschierte Spitze, die an der Basis einen Schäftungsdorn aufweist. Diese Art von Pfeilspitzen ist in der kupferzeitlichen Remedello-Kultur in Oberitalien verbreitet. Das Rohmaterial ist mit größter Wahrscheinlichkeit der bekannte Feuerstein der Monti Lessini in der Prov. Verona, aus dem auch die sechs Feuersteingeräte des Eismannes gefertigt wurden. Archaeologists in northern Greece have found a rare group of ancient graves where farmers were interred with their livestock, a Greek daily reported on Friday. At least 11 adults and 16 farm animals were found buried together near the town of Mavropigi in the northern region of Macedonia, some 21km from the city of Kozani, Ethnos daily said. The men, women and a child lay alongside horses, oxen, dogs and a pig in two rows of graves, the area's head archaeologist told the newspaper. A submerged ancient Greek city, from the heroic era portrayed in Homer’s Iliad, is being ‘raised’ from the bottom of the Aegean. Using cutting edge underwater survey equipment and site reconstruction software, archaeologists and computer scientists have joined forces to map and digitally recreate a Bronze Age port which was swallowed by the waves up to 3000 years ago. It’s the first time that a submerged city has ever been fully mapped in photo-realistic 3D. Curtis Marean received his Ph.D. from the University of California at Berkeley in 1990 and is now a member of the Institute of Human Origins and School of Human Evolution and Social Change at Arizona State University. In addition to studying climates and environments of the past,his research focuses on the origins of modern humans, the prehistory of Africa and the study of animal bones from archaeological sites. Much of his recent work involves anthropological finds at Pinnacle Point, a sea cliff along the south coast of South Africa where a large number of caves overlook the Indian Ocean. In 2007, Marean and a team of researchers reported finding evidence at Pinnacle Point that suggests humans may have eaten seafood more than 40,000 years earlier than previous estimates and it may have been a catalyst for early human migration out of Africa. The 67 Iron Age coins were discovered by a metal detector in October last year but details of the find, described as significant by a curator at the British Museum, were only made public last week. The coins were subject to an inquest at Lawrence Court in Huntingdon on Thursday (September 29), where it was down to the deputy coroner of Cambridgeshire, Belinda Cheney, to determine if the hoard should be officially classified as treasure. After their discovery, the coins were sent by a local finds liaison officer to the British Museum in London, where they were examined by the curator of Iron Age and Roman coins, Ian Leins. In his report to the inquest, Mr Leins expressed his opinion that the coins were treasure, as defined by the 1996 Treasure Act. The inquest heard that the coins were discovered by Andrew Thomas, from Loughborough, in a field owned by John Williams, on October 26. The find included 67 gold coins known as staters, and a single quarter-stater coin. THE official launch of a European project with the Dover Bronze Age Boat as its centrepiece has taken place in France. Boat 1550 BC Bronze Age Maritime Communities, funded with £1.7million of European Interreg cash, is a three-year education and exhibition project. It is jointly run by the Dover Bronze Age Boat Trust and Canterbury Archaeological Trust, the University of Lille 3 and European Social Sciences and Humanities Research Institute (MESHS), Canterbury Christ Church University, Ghent University, INRAP (the French national archaeology service), the Conseil general du Pas-de-Calais, the town of Boulogne-sur-Mer and the British Museum. igital archaeologist Henry Rothwell was working on graphics for a smartphone app about the world famous monument of Stonehenge and the wider landscape, and required imagery for the Bluestonehenge section. What followed was a discovery that shines new light onto the ancient alignments of the henge monuments. Using an image by archaeological photographer Adam Stanford, taken during the excavations on The Stonehenge Riverside Project, Rothwell created a digital circle of stones and overlaid the images. In discussion with Adam Stanford, he realised that a stone hole had been missed from the reconstruction on the far right. This prompted Henry to return to the digital model and increase the circumference to take in the ‘extra’ hole, however it looked too large and no longer fitted well with the other stone holes. Prehistoric animal bones have been uncovered by archaeologists as they carried out excavations for a Crossrail tunnel in Westbourne Green. The remains, found near Royal Oak station, include those of bison, deer and the auroch, a large ancestor of modern cattle. Some of the bones appear to have small marks on them which may suggest butchery by humans. They will now be cleaned and studied before they are incorporated into the Natural History Museum's permanent collection. The finding of the 17-year-old girl's grave adds more evidence that henges were linked to death rituals. Four to five thousand years ago, a wealthy teenage girl was laid to rest in a grave at what archaeologists believe is a newly found henge in Kent, England. The discovery of the 17-year-old's grave -- along with a unique prehistoric pot inside of a ringed ditch near two other women -- strengthens the idea that important death-related rituals took place at many of these mysterious ancient monuments when they were first erected. A UK archaeological research team are returning to Jersey this October to undertake scientific analysis at the Neanderthal site of La Cotte de St Brelade. The team, funded through a National Environment Research Council (NERC) Urgency Award, are currently mobilising to undertake sampling and stabilisation work ahead of winter. The site and the team’s research featured in Digging For Britain, on BBC2. How modern-day humans dispersed on the planet and the pace of civilization-changing technologies that accompanied their migrations are enduring mysteries. Scholars believe ancient peoples on Europe and Asia moved primarily along east-west routes, taking advantage of the relative sameness in climate, allowing technological advances to spread quickly. But what about in North and South America, with its long, north-south orientation and great variability in climate? How did people move and how quickly did societal innovations follow? The so-called finger flutings were discovered at the Cave of a Hundred Mammoths in Rouffignac, alongside cave art dating back some 13,000 years. Cambridge University researchers recently developed a method identifying the gender and age of the artists. Adetailed survey of every stone that makes up Stonehenge using the latest technology, including a new scanner that has never before been used on a heritage project in Britain, has resulted in the most accurate digital model ever produced of the world famous monument. With resolution level as high as 0.5mm in many areas, every nook and cranny of the stones’ surfaces is revealed with utmost clarity, including the lichens, Bronze Age carvings, erosion patterns and Victorian graffiti. Most surprisingly, initial assessment of the survey has suggested that the ‘grooves’ resulting from stone dressing on some sarsen stones appear to be divided into sections, perhaps with different teams of Neolithic builders working on separate areas. A first glimpse of the model can now be viewed on the English Heritage website.